Witches are just hocus-pocus, bippity-boppity-boo… right? Wrong. For Jules and her friends Dani, Zahara, Margo, and Sascha, being a witch is a full-time job. They’re part of a coven of Revealer witches that hunt and kill the evil creatures that lurk in the shadows of the night. The clean up crew consists of the only two male coven members, Michael and Connor. When the girls turn eighteen, they are initiated into the inner-circle of the coven, and all the secrets are revealed to them. But will they like what they hear? 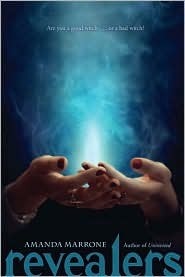 Jules is the youngest, and as she watches the changes in her newly-initiated friends, she begins having second thoughts on whether she truly wants to be a witch. Meanwhile, her relationship with long-time crush Connor blossoms. But they must keep their love secret, as it’s against the rules for the girls to have relationships before the age of eighteen. But is he really what he seems? Startling revelations come to light, and the whole coven is thrown into chaos. Can Jules and her friends stop it? As Amanda Marrone’s sophomore novel, I must say I was impressed. Revealers was a few steps up from her first novel, Uninvited, with more dynamic characters, and lots of originality. The Revealer witch idea was unique; I’ve never read about witches like that. The background to the witch coven added mystery and intrigue, and really made me enjoy the novel. These witches still retain the age-old stereotype of flying brooms and cloaks billowing in the wind, but bring a modern feel to it by having otherwise normal teenage girls hold the power. It’s fast-paced, and for once, the romance is only a minor sub-plot—very hard to find in today’s paranormal fantasy. I admit, I could see the ending coming from a mile away, but I still enjoyed Revealers nonetheless. It was uncomplicated, but in a good way that made it easy and quick to read. I give this novel 4 out of 5 stars. Nice review. The book sounds like a fun read. I agree, the revealer witch idea is something that I've never come across before. It's clever. Wish I had thought of it lol. This one of book that I have never seen but in your blog. Some of the previous books are also new for me. I think I am going to liked this book since it's about withces.